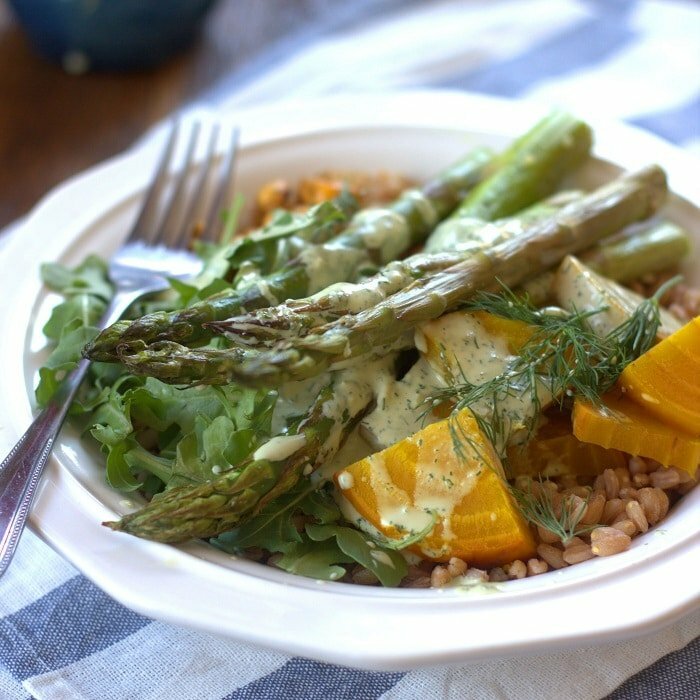 This warm farro salad is topped with garlicky roasted asparagus, golden beets, crispy chickpeas and a rich tahini dill dressing. My cat has a new thing. Cat owners, you know what I’m talking about. Cats…they get stuck on…things. Anyway, the slightly older, fatter, and snugglier of my two guys suddenly wants to be on my lap. All. Day. Long. I’ve been working from home for about a year and a half now, and for about a year and five months, he could’ve cared less. Then, suddenly, he got into the habit of approaching me at my computer, staring me down, and letting out an occasional wimper until I pick him up. He won’t even jump up on his own, and if I don’t pick him up, he continues his wimpering and staring until I do. Okay, maybe I don’t mind so much. After a while I even get used to typing over a big chubby ball of fluff, and it’s kinda nice, until he decides, completely randomly, to bail. Then I’m left with a big vacant, chilly lap. I suspect this will stop once the weather really warms up. For now though, I’ll take a big fat cat to help keep me comfy and warm while I work. And then there’s roasted veggies. I don’t know if roasted veggie bowls are so much a spring thing to everyone else, but I certainly find myself gravitating towards this type of meal during March and April. 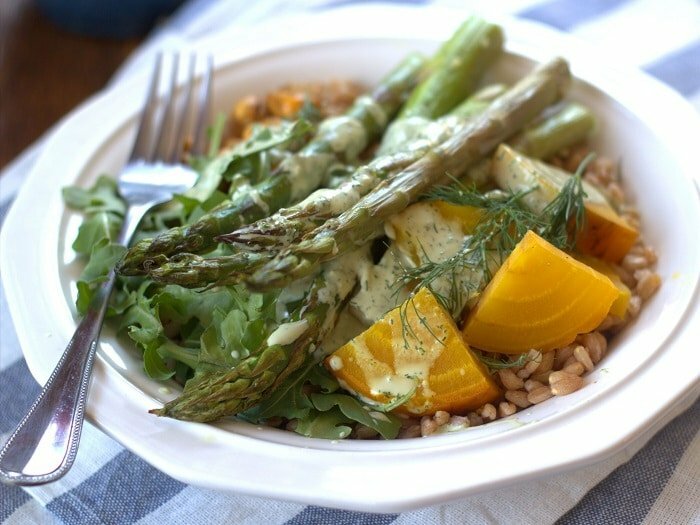 On the one hand, you’ve got early spring veggies like asparagus, and when you add some dressing and grains you can totally call it a salad. On the other hand, it’s warm and comforting, as this one indeed was. And then there’s the dressing, which is reason enough to make this, making the bowl as a whole completely satisfying, and maybe just what you need to get through the next chilly month or so. Toss asparagus spears with 1 teaspoon of olive oil and garlic. Arrange on baking sheet. Rub beets with 1 teaspoon of olive oil and loosely wrap in foil. Toss chickpeas with 2 teaspoons of olive oil and arrange on baking sheet. Sprinkle with salt and pepper. Place asparagus, beets and chickpeas in oven. Remove asparagus after 15-20 minutes (according to desired tenderness), flipping once during baking. Sprinkle with lemon juice and salt and pepper to taste. Remove chickpeas after about 30 minutes, when browned and crispy, tossing once or twice during baking. Remove beets after 40-60 minutes, when easily pierced with fork. Allow to cool, and then gently rub to remove peels. 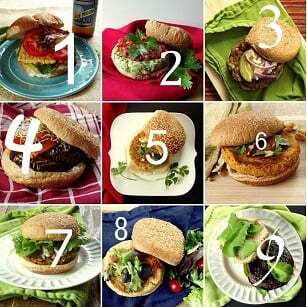 Cut into wedges or slices. 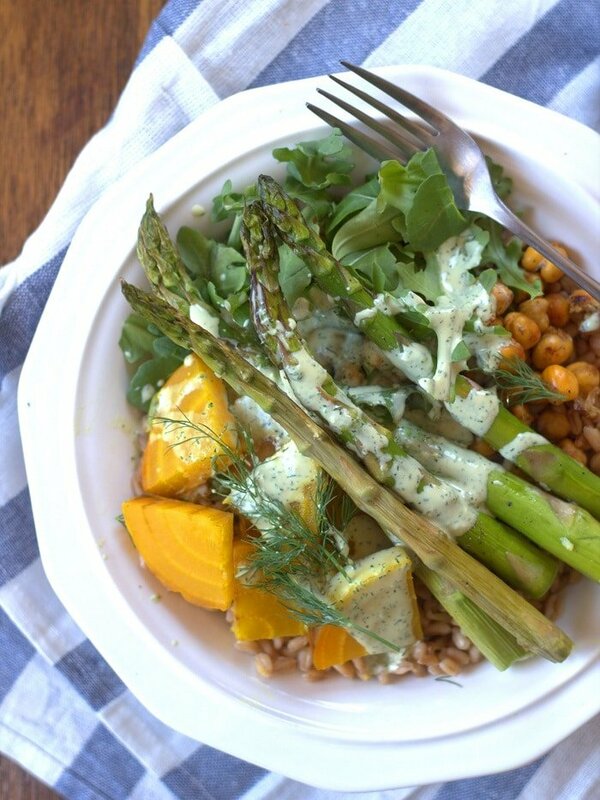 While vegetables and chickpeas roast, place farro in medium saucepan with broth. Bring to a simmer, lower heat, and allow to cook at a low simmer until tender, about 30 minutes. Remove from heat and drain. While vegetables and chickpeas roast, place dressing ingredients into food processor bowl or blended. Blend until smooth, adding water to desired thinness. 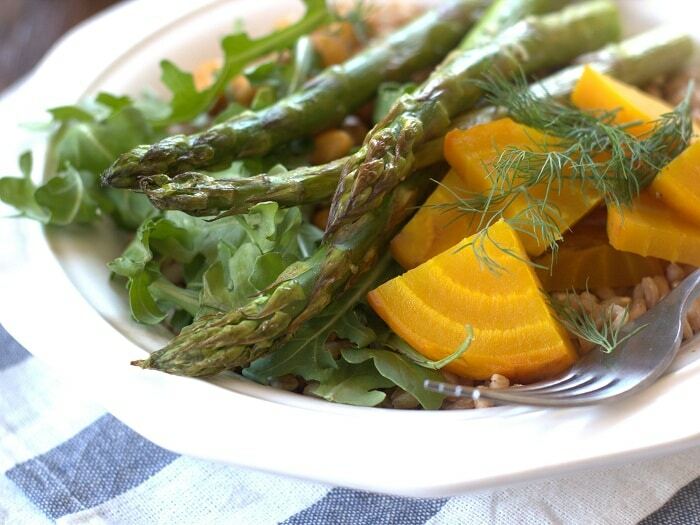 Divide farro among bowls and top with baby arugula, asparagus, beets and chickpeas. Sprinkle with salt and pepper to taste and drizzle with tahini dill dressing. I just made this tonight and it was absolutely delicious! I decided to not use arugula for this dish and instead, to make use of the greens from the golden beets. It was my first time making and eating golden beets and eating their greens. The greens were fantastic in this and I highly recommend using them :) Just remove the stems, hard veins and chop….you can even coat them with a little bit of the dressing before drizzling the rest on the whole salad. It’s a great way to save money on the dish…use what’s already there! Oh nice! Beet greens are one of those things I don’t have a ton of experience with and I’m always looking for ways to use them, so I love that idea. Next time. :) So glad to hear you enjoyed the dish!